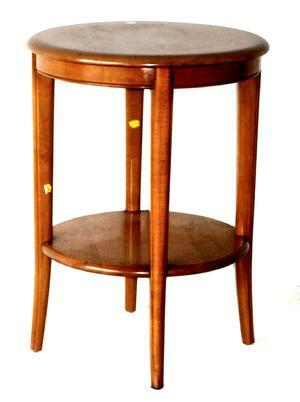 Round modern form lamp table, found with finish in rough condition. Mate to Rectangular Lamp table #MM013, which is in a customized contemporary high polish black lacquer finish. "Very Good Original Condition." Table is very sturdy and solid and will be finished to order in premium contemporary finish. Table was sourced through New England's largest auction house, and the H-W attribution is theirs; any further information along these lines is very much appreciated. Strong mid-century form with stylishly updated finish. Table is marked on bottom F2.3021 GLAMOURTONE LAMP TAB.17. We have a matching rectangular lamp table in an original high polish black rub through lacquer finish (see MM013 HW Rectangular Lamp Table); contact the gallery for additional information.